Abstract: The KM51PV-AM2 is based on the nVIDIA GeForce 6150 and nForce 430 chipsets, and as such it supports all current socket AM2 AMD Athlon64/FX/X2 and Sempron processors. If you've ever wished you didn't have to watch DiVX or xvid movies on that dinky computer monitor, you're in luck because now is an excellent time to piece together a Home Theatre PC. Small and powerful, a Home Theatre PC (HTPC) combines the usefulness of a computer with the raw movie-watching capabilities of a full entertainment center. At the moment, computers built upon the AMD Athlon64 architecture offer the best set of options and video output features that those building a HTPC crave. It's not the CPU so much as it is the chipsets being released by companies like nVidia for K8 motherboards. 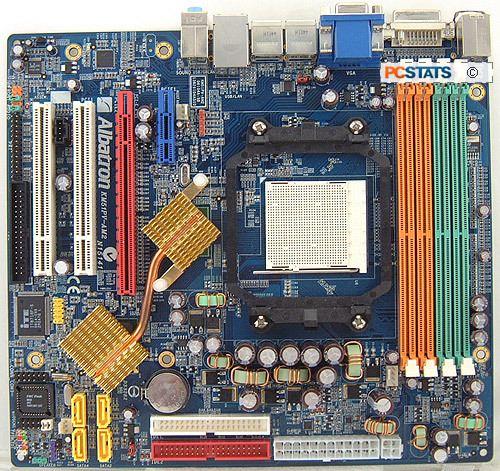 In particular, there are quite a few motherboards with chipsets that are down right cheap. Such frugality makes the prospect of constructing an affordable well equipped computer, a remarkably easy endeavor. Unlike the hey-day of desktop computers, the sub-$500 PC is no myth in 2006. AMD's Athlon64 and Sempron processors have both been ported over to the socket AM2 platform, and you might be surprised to find entry-level models retail for little more than $100 CDN. Aggressive pricing of processors is just one of the tactics being used to win consumers over to the K8 platform, but realistically it's just a really nice deal. Why spend money when you don't have to on a computer? Looking for the Albatron KM51PV-AM2 Motherboard? The North American & US distributor for Albatron videocards and motherboards is NU MEDIA System USA Inc. in Walnut CA. Contact Mr. Charles Chuang (T: 909.598.5061) for on availability on the KM51PV-AM2 board. An upper-model number AMD Sempron, or value-oriented AMD Athlon64 is more than capable of running every task you're average person can throw at it. Since all the latest processors are on socket AM2 now, DDR-2 memory has become equally as affordable as its demand has ballooned. What remains is a bit of a challenge for anyone setting about to construct a computer on the cheap, and that's the graphics. Graphics cards is the one component you can't do without because it takes what is happening on the computer and translates it into data a CRT monitor or LCD display will understand - the good ones will even allow you to output video to a standard TV or HDTV! The tricky part is that videocards are like cars, you can spend an utter fortune to go a little bit faster than everyone else, or you can save a sheer fortune and go nearly as quick on most roads. The computer industry thrives off of the masses, those of us driving in the inexpensive cars at a reasonable speed, but it's the crazy drivers speeding down the highway at breakneck rates that get all the press. Such is life in the tech world. nVidia has seized upon its inherent graphics expertise and created several chipsets for the masses which handle all the tasks chipsets normally do on a motherboard, and incorporate extra logic to also take over the role of videocard. The industry name for this is 'integrated graphics', and it is both a blessing and a curse depending on whom you speak with. Gamers in particular, find integrated graphics about as constricting as an 800lb python. The nVIDIA GeForce 6150 is the best of the bunch when it comes to integrated graphics chipsets for the AMD Athlon 64 platform, and it integrates video, TV-output, multi channel audio, and network connectivity into one little tiny chip. Perhaps most surprisingly, the integrated Geforce 6-series graphics are relatively good too. Little tiny all-in-one chips help make compact microATX motherboards a reality, and inexpensive compact computers a result. Perfect for HTPC builders! The Albatron KM51PV-AM2 is one such microATX motherboard which fulfills multiple usage roles. The KM51PV-AM2 is based on the nVIDIA GeForce 6150 and nForce 430 chipsets, and as such it supports all current socket AM2 AMD Athlon64/FX/X2 and Sempron processors. The bargain basement prices of the AMD Sempron 64-bit processor are genuinely the best suited for the KM51PV-AM2 motherboard, but for the purposes of comparison we'll be benchmarking with a slightly more powerful AMD CPU. Albatron's KM51PV-AM2 motherboard has four DDR-2 DIMM slots, and these will accommodate as much as 8GB of dual channel ECC/non-ECC DDR2-800 RAM (PC2-6400). The Geforce 6150 is also goes by the nForce4 C51PV code name, while the nForce 430 Southbridge is also called the nForce4 MCP51. As the GeForce name indicates, the Geforce 6150 chipset is more graphics card than it is motherboard core logic. It fulfills each role well, and will even accomodates both DVI and analog monitors much like a standalone videocard does. Analog VGA cables are used with CRT and LCD display's, whereas digital DVI VGA cables are the exclusive realm of LCD monitors. Either style of monitor, or both, can connect to the Albatron KM51PV-AM2 motherboard at the rear I/O panel. This has led to a sight trade off in terms of connectivity, and you'll notice the parallel printer port is absent from the KM51PV-AM2 motherboard. The data pins for the parallel port have been relegated to a space next to the floppy disk drive connector, and with a bracket that fits into a free PCI bracket printers of this type can be installed. An abundant selection of USB2.0 jacks are the preferred way of supporting external devices like a printer, scanner, or digital camera - if you haven't upgraded already this is certainly a good push in the right direction. There are six USB2.0 jacks at the rear of the board, along with 5.1 channel audio mini-headphone jacks and a single Gigabit Ethernet network socket. A bonus to the Geforce 6150 is that the VGA video jacks support multi-monitor video output; allowing you to span or clone a WindowsXP desktop across more than one monitor (CRT or LCD, you cannot use two analog monitors at the same time since there is only one RAMDAC). Building on top of its strengths, the KM51PV-AM2 even has a TV-output header. 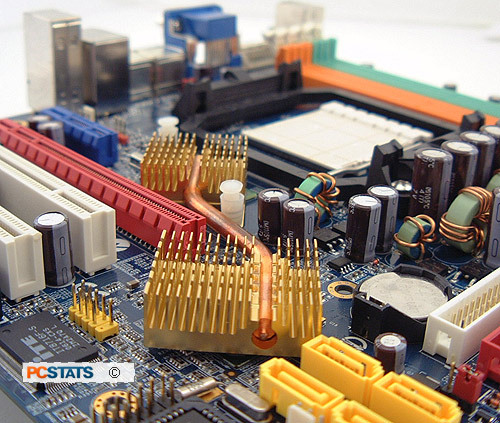 Two 32-bit PCI expansion slots, a PCI Express x16 and PCI Express x4 slot are also readily at hand for other stand alone devices that may be called for in the future. And naturally, if the onboard videocard proves too restricting a PCI Express x16 videocard can just as quickly be installed. Hard drives are supported via four 3.0GB/s SATAII ports that include RAID 0/1/0+1/JBOD support for enhanced data redundancy or access improvement. Optical drives may be connected to either of the two UltraATA 133 IDE channels (each of which accomodates exactly two IDE devices), so slap in a dual layer DVD burner and you're good to go! Up next, a little discussion on the Geforce 6150 and what it brings to the table. Pg 5. Overclocking the KM51PV-AM2! Pg 11. What a speedy MicroATX motherboard!